Let’s talk about kitchen fears, shall we? Let me start off by saying that I lovelovelove to bake. There’s nothing more rewarding for me than handing a finely-crafted sweet treat off to a unsuspecting friend or family member on a special occasion. Birthdays, holidays, events, random days of particular kindness – I’ll literally bake for anything. The problem with my baking endeavors is that I never bake my own recipes. Instead, I always turn to the pros: Sally’s Baking Addiction, Joy the Baker, Half Baked Harvest, and, my man, Alton Brown. The thought of baking a from-scratch recipe has always terrified me, as I know that baking has to so precise, so exact, and so calculated. Do I use baking soda or baking powder? How much flour will I need to balance the amount of fat? And once we start talking about gluten free and vegan baking substitutions? Forget about it. I just knew that I’d be a devout recipe follower for the rest of my baking career. After making a blogger’s oatmeal raisin cookies for Mark’s family, I decided enough was enough. No way was I going to be scared of an oven and the science behind the perfectly browned baked goodies. I got to work and combined some of those leftover cookie ingredients, popped the mixture into the oven, waited until the house smelled good, and removed it and waited for them to cool. The result? I pretty much invented 15-minute banana bread. I think that I may need to try this baking thing more often. 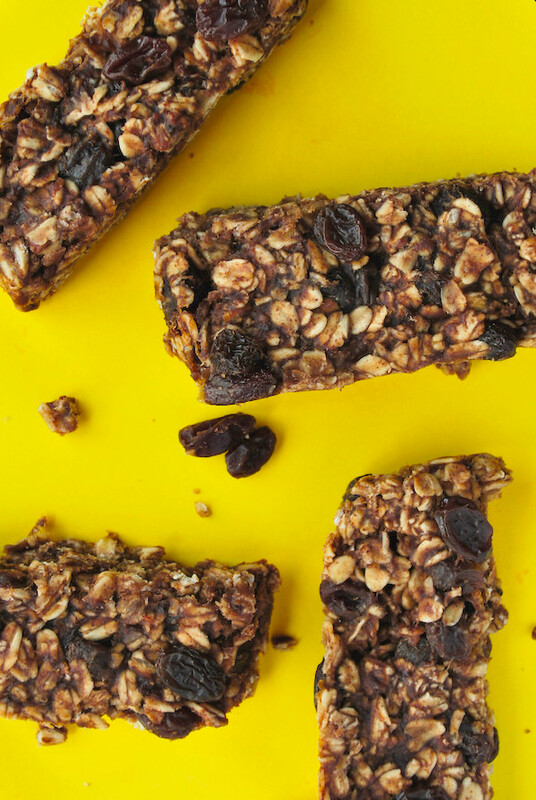 These Banana Bread Granola Bars are the real deal. 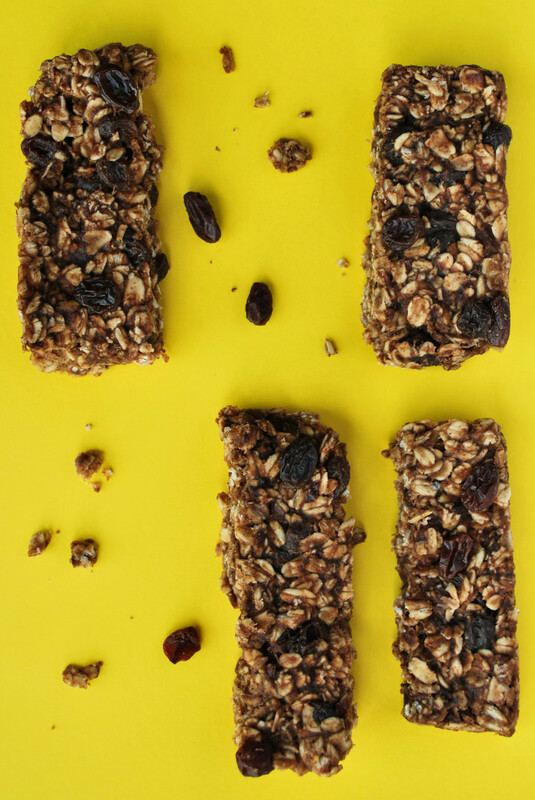 Made up of some of my favorite whole foods, these Banana Bread Granola Bars make a healthy breakfast or snack, and I’m tellin’ you: they could NOT be more simple to make. 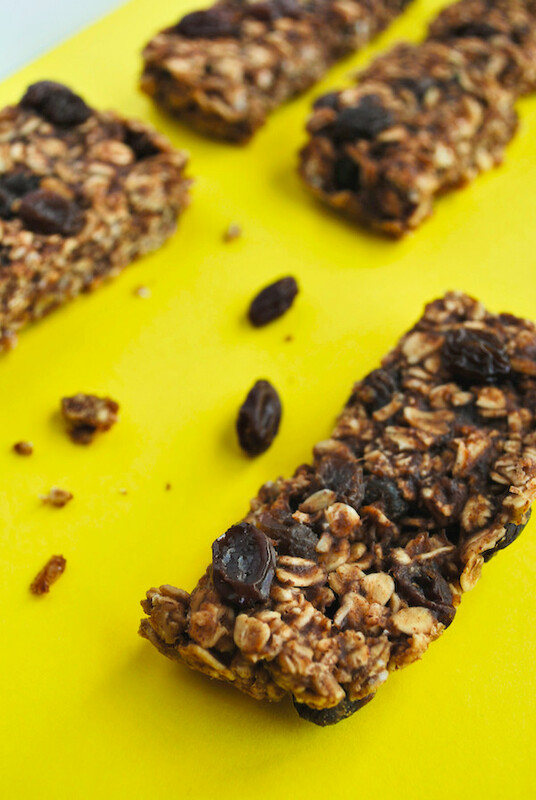 If you can use a mixing spoon, you can make these Banana Bread Granola Bars. Oh yes, dear reader, snack time will never be the same again. You don’t need sugar or hydrogenated oils hiding in your nut butter! Nuts are fatty, creamy, and mouthwatering enough! Next! A single banana! I love me some bananas (see here! and here! AND here!) because they naturally sweeten whatever they’re thrown into. That being said, be sure to use the blackest, spottiest, and softest banana you have, as it will be the sweetest of your bunch. The structure in these Banana Bread Granola Bars comes from rolled oats. You all know that I have a serious addiction to oatmeal, so I never pass up an opportunity to use them in a recipe. The rolled oats are the stars of this recipe, as they give these granola bars such an addictive chewy texture. I’m SO hooked on that chew. To play along with the “banana bread” theme, I threw in some cinnamon and vanilla extract to the mix. Nutmeg would also be wonderful if you have it! I also wanted to use some mix-ins, so I chose to throw in some sweet raisins. Feel free to add walnuts instead, but I think the raisins added the perfect sugary bite. A note on sweetness: it’s totally up to you! Be sure to taste your mixture prior to putting it into the oven. If you think it needs more sweetness, I’m sure that honey or maple syrup would do wonders here! You may need to adjust your dry ingredients accordingly, however, to get the correct consistency. No matter how you sweeten up these Banana Bread Granola Bars, I can assure you that they will be nothing short of snack time perfection. How many ways can I tell you that I adore these Banana Bread Granola Bars? And in a mere 15 minutes, you can be ready to dive into these suckers for a perfect snack time treat. Spread with some rich coconut butter or dipped into a creamy nut butter, these Banana Bread Granola Bars are your answer to a quick and easy summertime pick-me-up! These Banana Bread Granola Bars are a gluten free and vegan snack that tastes just like the classic baked treat! Preheat your oven to 350 degrees F. Line a bread loaf pan with parchment paper. Set aside. Melt your nut butter in a glass bowl in the microwave until it is easily mixable and drippy**. Allow to cool slightly, then add pureed banana, cinnamon, vanilla and optional salt and sweetener. Mix well to combine. Add oats and mix to combine. The mixture should form a ball, but it should not be too wet or dry. If it's too wet, add more oats. If it's too dry, add a bit more nut butter. Mix in the raisins. Taste, and adjust seasoning/sweetness if necessary. Scoop mixture out into prepared loaf pan. Press down so that your granola bar mixture is flat. Top with additional raisins if desired. Bake for 15 minutes. Remove from oven and keep granola bars in the pan for 10 minutes. Remove from pan and parchment paper and place on a cooling rack to cool completely. Cut into bars and serve! *When I made these bars, the only sweet ingredients were banana and raisins, so they're not very sweet. One of my taste-testers said that these bars needed more sweetness. My other taste-testers believed the amount of sweetness was sufficient because they are more "snack" bars, rather than "dessert" bars. If you DO add an additional sweetener, you may need to adjust the dry and wet ingredients in order to obtain the correct consistency. **My nut butter (peanut butter, obv) was already in this state, so I skipped this step. I feel the same way!! I love to cook & bake ALL THE THINGS and love nutrition and healthy living, and I’ve been thinking about starting a food blog for awhile, but I’m so scared to experiment and fail! But I guess that’s how everyone starts. Who knows! love how easy this recipe is! the only time i like bananas is when theyre in baked goods (most especially banana bread!) so i think i will love this recipe! Hi Alexa! I just started my own food blog and am feeling the same fears – it’s hard coming up with your own recipes and putting them out there! This has definitely inspired me a bit to go for it. Do you you have any advice for new bloggers? Also, I can’t wait to try this recipe! I absolutely love banana bread and like the fact that I can eat these on the go! I think that it is SO awesome that you started your own food blog! Committing to having an actual blog to your name is a huge step, and you should be proud of yourself for it! I took a look at your blog, and I think it looks great. Your writing is so fun and entertaining – and that giant donut…OMG. As for blogging advice, I have found that having a schedule has helped me IMMENSELY. For example, I know that I post new recipes on Mondays and Thursdays, and I post a recipe roundup on Saturdays. Because I set this schedule, I know that I have to plan my week around writing, shooting, editing, social media-ing, etc. Other than that, my BIGGEST advice is to stay confident in yourself. If blogging truly is your passion, make it happen. Although sometimes things may not go according to your plan, if you want it enough, you can make it happen!